A properly working heater is essential for the cold nights, here in North Texas! If your home heater can’t keep up with the dropping temperatures, it may be time for us to come out and perform heater repair. We are here for you when the cold snap happens and your family is feeling the cold indoors. Our team of trained and experienced HVAC professionals can come out, diagnose your heating unit and get it back in working order. We offer the best heater repair services of anyone in the area! Keep your home and family warm during this Winter! When we get a call from a customer the first thing we will do is diagnose the problem. Using the best tools and equipment we will find the root cause of your heater problems. Proper diagnosis allows us to make sure we get everything fixed right the first time. This also helps to minimize the amount of time it takes to complete the fix. We always stand by our work, whether we have to replace a part, rewire a unit or any other repair procedure. We only use high quality replacement parts which come with a full warranty, so that will provide you with protection as well. 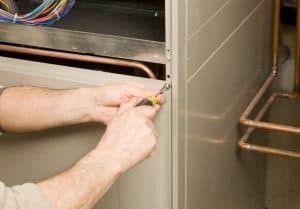 When you call us to have a heater repair technician come out to your home or business, we don’t take this trust lightly. All of our employees have completed full background checks and have an exceptional reputation for high quality customer service and treating all our customers with respect. They will arrive on time and ready to get to work fixing your heater. If you ever have any questions for us or the repair technician, please don’t hesitate to ask us. We’re there to assist you with anything you need.